Tyson Fury, the 256½-pound Englishman, was laid out on his back panting as Deontay Wilder engaged in a victory dance in the twelfth round at Staples Center on Saturday night. The fight was over by knockout, or so the world thought. As the referee counted, Fury got up. The crowd collectively gasped. 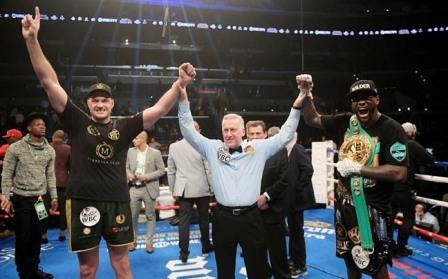 The WBC heavyweight title main card fight between Wilder and Fury resulted in a draw. It was the tale of two drastically different boxers in style and stature. Wilder, the six-foot-seven Tuscaloosa, Alabama native, walked out towards the ring sporting a gold crown and matching face mask with a peacock feathered cape. Wilder was led by Los Angeles native rapper Jay Rock who performed his hit song, “Win”. He entered the ring as the champ with a 40-0 record, that included 39 knockouts and the WBC heavyweight belt. “Fighting gives me a passion, a goal, a purpose in life,” stated Fury. It was exhibited by the sheer will he displayed to get up in that final round knockdown. According to the judges’ scorecards, Wilder was being outboxed for nearly the entire fight . The saving grace for Wilder was managing to land punches that produced two knockdowns in the ninth and twelfth rounds. 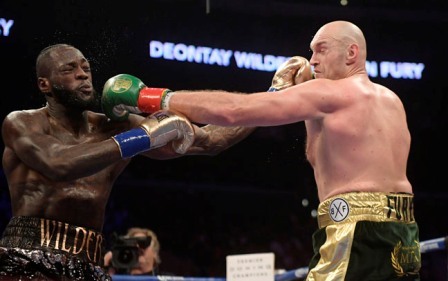 Wilder heavily relied on landing a power punch, which appeared to tire him as the rounds wore on, whereas Fury continued to consistently land jabs and connect on combinations. “Deontay Wilder is relying on one move,” Floyd Mayweather told Showtime during the fight. Fury displayed his mastery of the mind games as he stuck his tongue out and wiggled it during the fight. He pranced around the ring with his hands held high trash-talking as to taunt Wilder. Ultimately, Judge Alejandro Rochin, of Mexico, scored the fight 115-111 for Wilder, Canadian judge Robert Tapper had it 114-112 for Fury, and British judge Phil Edwards had it 113-113, which meant that both fighters remained unbeaten.